Happy Easter! To celebrate the day, I want to share with you another piece of ecclesiastical embroidery – this time, an elaborate super frontal for an altar. In Catholic and Anglican churches, the altar in the front of the church would sometimes be adorned with an antependium, or frontal. If made of cloth, the frontal was usually embellished, either embroidered or appliquéd. In some churches, especially larger churches, a super frontal would also be used (“super” actually from “supra,” meaning “above” the frontal) in addition to the frontal. The super frontal was a long decorated piece, not very high, but wide enough to span the width of the altar. Sometimes, it was “built into” the frontal (separated, for example, by trim, to mark off the super frontal area), but more often, especially in more elaborate churches and chapels, it was a separate piece. Think of it like a valance, almost, floating above the frontal. 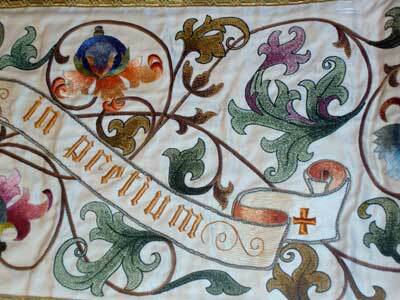 This super frontal was embroidered by the Benedictines in Clyde, MO, before the 1950’s. If you’ve been reading Needle ‘n Thread for a while, you will probably recognize the look of it, as it was a source of inspiration for me when I embroidered an ecclesiastical piece a few years ago. The piece is very long – I would guess at least 10 feet in length, perhaps longer. The center medallion is the Agnus Dei symbol. 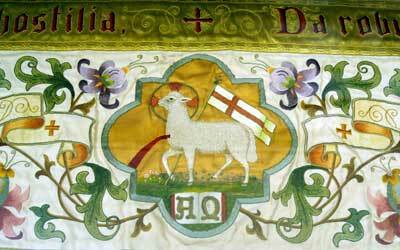 The Lamb with the banner is a representation of Christ, sacrificed and triumphantly risen from the dead. Around the central medallion are many colorful scroll designs featuring plenty of stylized pomegranates, which, in ecclesiastical embroidery, symbolize resurrection and new life. The embroidery on the center medallion is worked on a dark gold-colored cloth. It’s not shiny silk, though it might be silk. It has a kind of noticeable weave to it. When I first saw it, I thought it was a strange color for the background – but, in relation to the colors in the rest of the super frontal, I think it works really well. From this side view, you can also see that there are banners with text embroidered on them. Here, you can get a better view of the scrolls, acanthus leaves, and stylized pomegranates. The leaves and vines are worked in chain stitch. The stylized pomegranates are worked mostly in long and short stitch, although the undersides of the turned up leaves are worked in satin stitch. 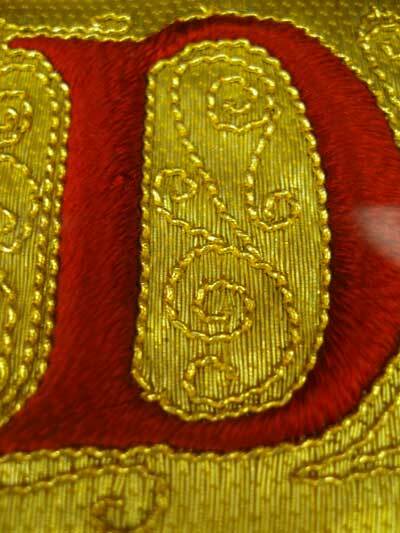 Across the entire length of the top of the super frontal, there is a goldwork strip, punctuated by lettering satin stitched in red. 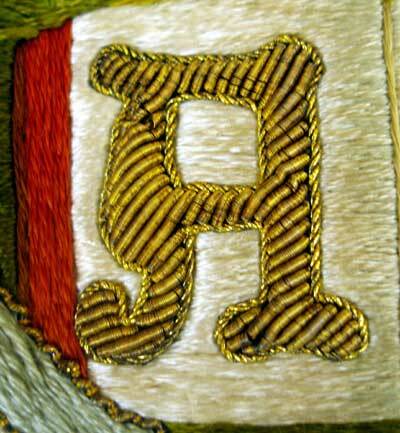 The gold background threads are evenly couched in a pattern, and on top of the gold, inside and around the lettering, are scrolls worked with a wavy gold thread, like rococco. I have heard that the Sisters at this convent, and at the (no longer functioning) convent in O’Fallon, MO – where the Benedictines also made elaborate ecclesiastical pieces – had machines that couched the gold background threads two at a time. I’ve never seen a couching machine, but I’ve heard from someone who was fortunate to receive one of the machines from O’Fallon before they disbanded their embroidery workshop, that the machines do indeed couch two laid threads at a time with precision, without damaging the threads. It’d be interesting to see that in action! At the base of the Lamb is a book with the Alph and Omega on each page. I really liked this symbolism, so I was sure to include it in my Agnus Dei. The lamb I drew is not as angular, and the banner is a bit less angular as well. The wool on the lamb on the super frontal above is what really caught my eye – it is the most realistic wool I had ever seen embroidered, so I wanted to imitate that. It was fun, figuring it out, and it turned out well. I’d love to do another piece like this – not the same piece, but similar – one day soon! If you want to read about the progress of this piece from beginning to end, you can check out my gallery. It’s near the top of the list, under ecclesiastical embroidery. You can also see close-ups of different elements in it, including the wool. I wish you all a very joyful Easter! 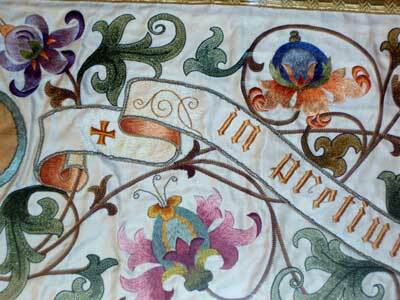 Thanks for the look at some lovely ecclesiastical embroidery. Perfect for an Easter break after the celebrations of the morning. Your piece is beautiful. Very nice work! Following your progress on this piece was what hooked me to your blog in the first place. Happy re-birth day. Mary, both of these pieces are beautiful! 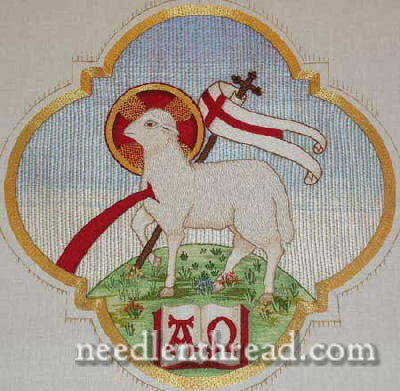 I especially love the symbolism of the Agnus Dei, and now I am curious about the one stitched on a banner in our church. Of course, it was displayed at our church yesterday. The altar cloths (I know there are specific terms for them all, but I haven’t learned them yet) are changed according to the liturgical seasons and I think many (if not all?) have been made by the (mostly) ladies of our Needlepoint Group. I especially love the kneelers at our communion rail, each with classical symbols worked on them. 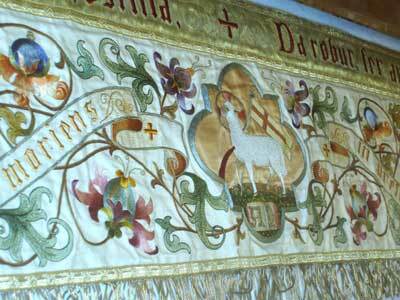 I will try to photograph the Agnus Dei banner to share with you. These are amazing 🙂 Do you know of any good resources for patterns on how to make these sorts of things? I would love to make a set of vestments, but I don’t know where to start with the embroidery, and I would love to do some of the needle painting that’s shown on some of these pieces. I noticed that my church had a set of white vestments and altar cloths with the same embroidered motif. It must be popular (these were machine embroidered, but still quite nice). It’s also in Lucy Mackrille’s book. One of the funniest things I realized was that all the sheep faced left except the cloth covering the chalice. I spoke with the altar guild ladies–they’d never noticed that, but they thought it was likely by purpose (aka, the representation of the body of Christ walks against the flock, keeps right, etc). It was a bit surprising, since my Episcopal church is rather Protestant and generally tends towards minimalist altar decorations. Mommablogger, I haven’t done any vestment sewing, but I plan to make some stoles, since I have two friends in seminary–and I’ve been told that these are welcome gifts (at least in the Episcopal Church, ministers are responsible for their own stoles). You might want to check out Mary’s post here about the Lucy Mackrille book. Also, I have heard that this woman here sells very nice patterns & materials (though I've never dealt with her). If you do decide to take on a project, before starting, you should check first with your altar guild. Churches can be picky about vestment styles. Also, generally, these items are bought as full sets–so they may want to team you up with others so they can get them done (or to replace/repair a random damaged piece). Wendybee–I'm always impressed with those kneelers. I started stitching one for my church, got through a couple of motifs then handed it over to another stitcher. Night after night of tiny tent stitch just about drove me bonkers! Are you selling this frontal? Our Church needs one for Easter. I am the Music Director/Liturgist and my Pastor has asked me to find something. Wow…this is awesome…so must be the price? Thanks and God bless you and yours. Does anyone have a pattern that I can use to make a Jacobean frontal style covering for our altar? Thanks!!! Next Next post: Monday Morning Post Holiday Delay!